Margareth Henriquez, President and CEO of Champagne Krug, has spent more than two decades of her professional career as the President and/or CEO of multinational companies in Venezuela, Mexico, Argentina, and now in France. In 1991, she was appointed as president of what would become the Venezuelan arm of Seagram’s, at the time a large importer and local producer of wines and spirits. 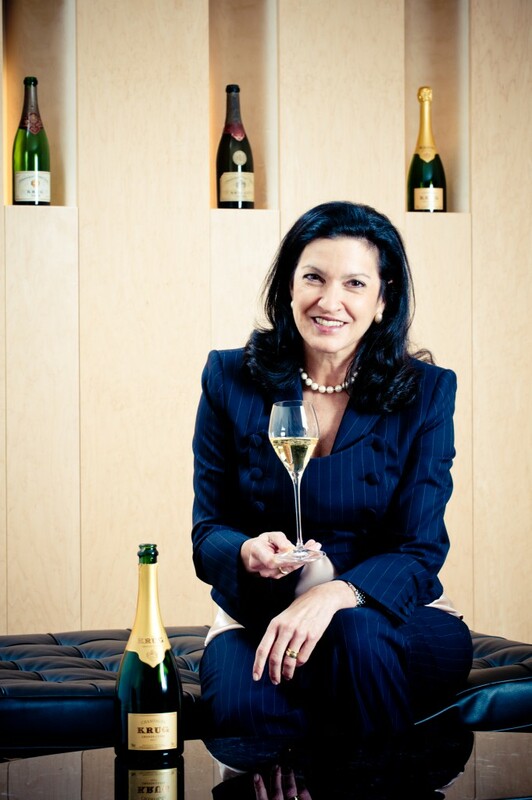 Moët Hennessy came calling and Margareth took charge of all their brands in Argentina, which led to her being offered her current position at the House of Krug in October 2008. A Harvard graduate, Margareth was brought on board at Champagne Krug to share with the world the vision of ultimate luxury. She is responsible for defining and maintaining the sophistication of the House of Krug. “Real luxury is always in front, is always the trend, so luxury can never be at the behest of what is increasingly demanding. It goes the opposite way—real luxury creates demand. Luxury will always be leading the way. It demands more than innovation and quality, yes. Luxury is the result of an emotional connection with the brand that comes from the way a brand behaves.”—Margareth Henriquez, Wine Vision. The House of Krug illustrates the amazing adventure of a visionary, Joseph Krug, a determined man with an uncompromising philosophy, who understood that the essence of Champagne is pleasure itself. He wanted to offer his clients the ultimate pleasure experience in Champagne every year, regardless of the annual changes in climate. Joseph Krug founded the first and only House with Champagnes that are all of equal, undisputed quality and distinction. In 1848, with his son still too young to take over the Champagne House, Joseph Krug consigned the founding principles of the House for posterity in a deep cherry-red notebook. This notebook symbolizes the act of recollection, but above all it represents the generous legacy made by a visionary to his family and to Champagne itself. It is a unique token that is now presented to guests at Krug’s historic home in rue Coquebert, Reims. Krug is the only House to offer five Prestige Cuvêes that are all different, while also remaining equal and undisputed in quality and distinction. Each Cuvee conveys a particular interpretation of nature, offering an inimitable experience the moment it is tasted, overwhelming the senses with exceptional pleasure. AWP: Champagne bestows a record of ownership from the beginning of its origin. We might say the Champagne drinker and connoisseur is also buying into the romance of that vineyard’s life. What is it about Champagne Krug that makes Champagne lovers connect in such a powerful way? MH: I would have to say that Champagne, in general, is never connected with connoisseurs. There are very few connoisseurs of Champagne, since for years it was seen much more on the side of brands than the product itself. Champagne is not a terroir wine region, connoisseurs focused on other regions. Champagne, as our founder very well knew, is pleasure; nobody opens a bottle of Champagne for any other reason than pleasure. The House of Krug exists to always offer the ultimate pleasure experience in Champagne, putting together all the sensations in flavours and aromas Champagne can give. Today, this is Krug Grande Cuvée, the center of the House. For almost two centuries, it has been seducing our beloved Krug Lovers, who we appreciate and are very grateful to. It is this possibility of always offering the very best we can offer every year that has created strong links of love between the House and its Krug Lovers and vice versa. MH: I would start by saying people, as it is people who created this amazing proposition of Champagne, the culture since Champagne rapidly became part of the culture of celebration and sharing glory, tradition since it has been kept through generations, fortunately today with a more complete approach as the wine is valued more everyday. In this last point, there is still a long way to go. This is why we have to insist that good and great Champagnes have to be drunk in normal white wine glasses, and not flutes. Any good Champagne is good wine first, and it deserves to be discovered fully. Champagnes drank in the right glasses can accompany different moments of the day and food also, enhancing the experience! MH: Compared to all sparkling wines, the Champagne region has a special soil and historical houses that have learnt to express the best of it. The soil, the cellars, the three grape varieties and having them in the right places, combined with the experience and knowledge of almost three centuries already in the Champagne creation make a huge difference to sparkling wines anywhere. We have to remember that in wine or Champagne, experiences are only once a year. When we talk about Champagnes, we also have to differentiate between the good ones and the extraordinary ones; I believe Krug belongs to this last group. AWP: Yours is an amazing success story of a long-term commitment of creating a foundation for today and for future generations. What is the secret of leading extraordinary Champagne with over a century and one half of history? What is the secret of its inimitable style? MH: The secret is rigor, discipline, and a culture of no compromise, born from our founder who was obsessed with making an undisputed quality in all of the Champagnes of the House. The next generations have continued the initial visions of the House of Krug, with the support of LVMH, who has been very supportive and a great encourager to go further in building prestige and quality. AWP: What is this pedigree like for you? MH: It is a source of enormous exigencies and a huge responsibility, which I assume with joy and pride. AWP: Winemaking in France has been an industry dominated by men. When you entered the industry in 1991, what were the challenges you faced and how did you grapple with the cultural differences? How has it changed? MH: I was in Venezuela in 1991, and I had no issue at all being a woman in a man’s industry, no issue at all. When I arrived in Argentina, it was harder, but it rapidly changed because I brought experience and a desire to work with the rest of the industry to improve our wines. Very soon many women came on board, and now in France I am old enough and have enough experience to feel comfortable. There are quite a number of very respected women in the world of wine and Champagne. AWP: From 1940-1946, during the Second World War, many women tended winemaking and running the Châteaux. How was it at Champagne Krug? MH: Jeanne Krug led the House by herself during the First World War, while Joseph Krug II was prisoner of war. She was an amazing woman who was awarded the three medals of war for the two wars. She is a source of pride and engagement for us. AWP: What was the best post-war vintage to date? What made this one of the truly great vintages? AWP: Respond to the demands created by the Asian market, the U.S. market, the South American market and the British market. Do you market differently to each? MH: We market the same to all, but each market has their own particularities. The South American market as well as China is a very weak market for us, unlike the rest. The U.S. and British markets adore the rarities and vintages, while other markets have a more balanced approach. But, we offer the same selection to all markets, we do not change anything to adapt to different markets, the offer of the House is at the disposal of all markets. MH: Yes, and it is not a vintage. The founder of the House of Krug’s, dreamed to use the non-vintage concept to go beyond the vintage every year to offer the best and richest expression of Champagne. He did not to wait for a good year to give a good Champagne. It is always a blend of over 120 wines from over 10 different vintages. Blending wines from so many years gives Krug Grande Cuvée all the flavors and aromas Champagne can offer, something impossible to achieve with one single year, even if it is the best. This is my preferred Champagne. Krug Grande Cuvée is the most original proposition in Champagne, and the reason the House of Krug exists. It channels everything I love about Champagne, every time, every year. MH: I find more people interested in discovering good Champagnes, people open to discovering Champagne differently, but to be honest, I do not look for connoisseurs. If we all agree that Champagne is pleasure, and then it is everyone who is a connoisseur of his or her pleasures. Thus, it is everyone who decides and I find more and more people, who love to hear this. AWP: You are the President, CEO, and luxury brand ambassador for Champagne Krug. Yours is a remarkable investment of your time and talents. Do you have a personal vision for France, its Champagnes, and oenotourism? MH: I love France. I think it is a magic country, they do not realize all they have. It is beautiful all over, wherever you go is fantastic. Talking about wine, unfortunately there is a law here called EVIN, which is dramatic. It treats the wine and Champagne regions of this country the same as any other alcohol. It makes me sad. But I am sure that nobody will ever take the place France has in the top wines and Champagnes, it is not possible. Oenotourism is growing, but for smaller houses like us, this is very difficult, because we can only receive guests privately by invitation. MH: Champagne was the first alcohol beverage I had ever tasted. When I was 8 my father allowed me a sip of Moët & Chandon when we were celebrating and thanking the people who helped us in our house. We used to do this every year. I always loved Champagne, it is very close to my heart and good Champagne is my choice above all choices. AWP: What are the great traditional culinary pairings with Champagne Krug? MH: There are many, especially if we talk about Krug Grande Cuvée. It is so rich and versatile, it goes with almost everything. My preferred pairings are: truffle chips, tarama, old parmesan or old compte cheeses, truffle popcorns, Jabugo jam, chorizo, tuna sandwiches, black truffle sandwiches, salmon scrambled egg, and so many more. It is incredible the number of amazing pairings we can do with Krug Grande Cuvée. MH: Nowadays, we find talented chefs all over the world. What we do not find, as much are chefs that are extremely interested in creating pairings to enhance the experience. We have many of these very few artists in our Ambassades. They are so creative and they all love to find a complete experience combining KRUG Champagnes with amazing food creations. Most other chefs rely on their sommeliers. We have Arnaud l’Allemand here in Reims, who is passionate for Krug. He has three stars and brilliantly pairs his creations with different Krug Champagnes. Christian Le Squer from Le Cinq and Guy Savoy in Las Vegas with a Krug chef’s table, they are all fabulous and they are all French. Tim Rawe in Berlin, Murakami in Kinoshita in Brazil, Bombana in Otto et Mezzo in Hong Kong, and Uwe Opocensky, our dearest chef also from our Krug Room in the Mandarin Hotel in Hong Kong. They are all great, those from France and those from the world! AWP: What unique and unexpected Champagne and food pairings have you found in your travels worldwide that bring us new and exceptional flavor experiences? Are you working with French chefs at Champagne Krug to adapt combinations discovered from your travels? MH: We are working on a surprise that will soon come to the markets, which integrates chefs from all over the world around one common Krug project, it is fantastic. Yes, our chef ambassadors, great chefs, and great Krug Lovers help us bring new creations to pair with our Krug Champagnes. I have discovered fantastic pairings travelling in Switzerland, at the Mandarin Hotel. I tasted a potato pastry with curry and Krug Grande Cuvée. Some Indian food also pairs wonderfully with it, it is all amazing. In Spain, I discovered anchovies with Krug Rosé, a wow combination. In New York, I was absolutely seduced by Krug 2000 and natural sardines. In France, the tomato water of Arnaud l’allemand with Krug Rosé, as well as his old Parmesan with Krug Grande Cuvée. Krug 1998 with a truffle soufflé in Paris, and recently the truffle chips and jabugo ham with Krug Grande Cuvée, among so many others!! MH: Of course we can do our own experimenting. It is enough to read a bit and then by tasting we will discover wonderful pairings. We suggest looking at our Krug APP or on, Krug.com and from there people can experiment. MH: They bring knowledge to the table. People like to be informed and love to make the right choices. Today’s selection is so broad that a sommelier can guide the table to making the best choices for the best experience. Someliers have big responsibility as they can recommend an experience enhancer. To be able to do this is a wonderful job. On the other hand, they are responsible for passing key messages about the glasses and temperature. They have to say that good Champagne should be served in a burgundy wine glass, and no flutes should be used. If they do not say it, people think they are right in using flutes. This example shows how responsible sommeliers are in teaching people. MH: In my experience, I am a true Krug Lover. I love the experiences and, I would love to capture these memories and make them last forever, but we have to accept it is not possible. So I am permanently in the search of great experiences with the parings as it multiplies the pleasure you can get from drinking Krug. MH: Yes, with Krug one can really orchestrate a full meal. One starts always with the apéritif and Krug Grande Cuvée. The current one that you find in the market today should be very fresh and still young. After the meal starts, the first Champagne should be a fresh vintage like Krug 2003, by knowing the Champagnes we can set the dish. I always start with the Champagnes and then I choose the food. So some shrimps to start with the Krug 2003, some small raviolis with truffles to go with Krug 2000, then the main dish, a nice lamb, will go with Krug Rosé, and to finish a nice peach tart with an older Krug Grande Cuvée. Due to the Krug ID, we can keep Krug Grande Cuvée in our cellars and bring it to the table years after, from 5 to 50 years, they get glorious. Finish with cigars and coffee. You open a Krug Collection 1989 served in cognac glasses. This is a Krug WOW dinner!! MH: The unspoken rules are all wrong. They serve very cold Champagne in little flutes, which is the opposite of how good Champagne has to be served. Progress has to be made in this matter. Very few restaurants do it, very few! AWP: Do North and South Americans bring a different set of expectations to the Champagne experience than do the French? MH: No I do not think so. Still, the Champagne celebrating approach is universal. We have to change this, but it will take a long time! MH: I do not think so; we find that major occidental countries have a lot of common characteristics. MH: There are good manners and bad manners all over the world. French good manners are what I was taught at home, and I believe they are the rules of elegance and savoir vivre! MH: Yes, we see how much younger generations like new experiences and change, much more than us in the past. I believe this is normal, the world moves so much faster now. There is something I know, in 100 years, people will continue to have ultimate pleasure experiences with Krug, just as it was enjoyed 170 years ago. MH: When I was little and I discovered Champagne, I knew I would always love it. But then later, the first time I had a wonderful paring experience, I knew Champagne would be my preferred drink. Obviously Krug is my favorite Champagnes, and Krug Grande Cuvée is my preferred Champagne. MH: I would like to complete my dream in this House. I would like to see the approach to Champagne changed, I would like this House, to be more known and recognized as what it is—the most luxurious and contemporary House in Champagne. And as such we should continue to be a charming and generous light that leads the way for many others. I would love to give conferences and give as much as I can what I have learnt. I do already, but want to do more. At the same time, I would like to continue to help younger women find their ways. I have a passion for giving; this is why I love Krug! Krug Grande Cuvée: Krug Grand Cuvée is at the center of the House and the reason the House exists. It began as the dream of Krug’s founder, Joseph Krug, who wanted to create the very best Champagne every year, regardless of climate changes. Thus he created the Krug Grande Cuvée, beyond the notion of vintage: it is a blend of more than 120 wines from more than ten different years, some of which may reach 15 years of age. Blending so many vintages gives Krug Grande Cuvée its unique fullness of flavors and aromas, its incredible generosity and its absolute elegance—something impossible to express with the wines of just a single year. Its exceptional finesse is the result of a stay of at least another seven years in the cellars. Over twenty years are needed to craft each bottle of Krug Grande Cuvée: the first prestige cuvée is re-created each year to offer the ultimate pleasure experience. As you taste it, notes of toasted bread, hazelnut, nougat, barley sugar and jellied fruits may take you by surprise. You may even taste hints of apples still on the tree, flowers in bloom, ripe and dried fruit, almonds, marzipan, gingerbread, sweet spices and even brioche and honey. You may also notice its exceptional freshness, with rich and tangy flavors of lemon and grapefruit enhanced by the subtlety of its fine and elegant bubbles. Krug Grande Cuvée can age beautifully. It lends itself to a plethora of culinary combinations, from the simplest to the most sophisticated, from extra mature Parmesan to a dish of turbot à la truffle. Krug Rosé: Krug Rosé is the only prestige cuvée rosé to be blended from a rich palette of wines from three different grape varieties and from a wide range of vintages. Theses are blended with a wonderfully expressive skin-fermented Pinot Noir wine to deliver its unparalleled and characteristic color, great structure, and spice. A resting time of at least seven years in Krug’s cellars gives Krug Rosé its subtle bubbles and long-lasting elegance. As you taste Krug Rosé, you will discover harmonies of puff pastry and red-berry tart, which develops into honey and citrus fruits. Its floral accents and notes of dried or stewed fruit will enthrall your palate. Its extreme delicacy is enhanced by the subtlety of its fine and elegant bubbles. Krug Rosé should be enjoyed alone or with foie gras, lamb, game, white meat, venison or anchovies, as well as very savory and spicy dishes. Try to avoid pairing with desserts; however, it can be matched with non-sweet desserts, that are generally more spicy. Krug Vintage: Unique to the House of Krug, every Krug Vintage is crafted to be different, and to reveal the expression of a particular year. A year with character, a year with a special story to tell in a way that Krug alone can relate. To narrate this story, Krug has blended very expressive wines from a single year, enhanced by a stay of over ten years in the cellars. Krug Vintage is the story of a year as seen by Krug; there are as many stories as there are Krug Vintages. Krug Vintage 2003: Krug decided to create a vintage for this particular year and named it “Vivacité Solaire” (Vivacious Radiance) to relate the unexpected story of a hot year that surprised Krug with fruit, freshness, balance, expressiveness, vivacity and finesse, all at the same time. Krug 2003 will continue to gain with the passage of time. At first sight, a subtle yellow gold color highlights its reserved finesse. On the nose, there are notes of citrus, plum, liquid honey and brioche. On the palate, fresh summer fruits, surprising red grapefruit along with candied peel, roast chestnut, and caramelized apple tart. It can be enjoyed with dishes involving quince and citrus fruits, such as veal, lamb and quince tagine, fine fish and/or shellfish with citrus-based sauces, and oysters au gratin. Recipes with spices, cinnamon, curry are good options, and for dessert a nicely prepared bread pudding with red currant coulis or citrus gratin. Krug Vintage 2000: Rich, precise, complex, and indulgent, the House of Krug wanted to create a vintage for the last year of the millennium, based on the unusual and climatically chaotic season. Known as “Gourmandise Orageuse” (Stormy Indulgence) this vintage brings together the complexity and the generosity of an exciting year. It also has a very high ageing potential. Krug 2000’s expressive aromas of caramel, nougat, hazelnut, freshly baked pastries fresh from the oven may touch you. Or by the flavors of citrus-fruit gratins, lime zest with a long finish and persistence. Krug 2000 has a very high ageing potential. Krug 2000 can be enjoyed with caramelized scallops with pineapple, spicy sauces, rich gravies, squab, confit of vegetables or citrus fruits, sweet-and-sour sauces, and even spices. Excellent with desserts containing roasted fruits (bananas, peaches, citrus fruits). Krug Vintage 1998: Krug 1998 offers astonishing purity, precision, elegance and a very long finish. The House of Krug focused on Chardonnay for Krug’s 1998 vintage due to the outstanding personality of Chardonnay grapes of that year. This vintage is known as our “Hommage au Chardonnay.” It is only the second Krug vintage, after 1981, where Chardonnay dominates. It has an extremely high aging potential. You may be touched by its expressive aromas of bread, hazelnuts, dried fruit, caramelized orange peel, then cocoa as it warms up, and finally pepper and gingerbread. Or by the flavors of crystallized citrus fruits, caramelized orange peel, dried fruits, pepper, and gingerbread with soft creamy texture. Krug 1998 has an extremely high ageing potential. Krug 1998 can be enjoyed with fish with fine flesh such as sea bass or turbot accompanied by lemon sauces or citrus fruits, as well as spicy or exotic dishes (Japanese, Chinese, Indian, Thai), with crystallized ginger and other spices. Krug Collection: Time’s second revelation of Krug Vintage. A very limited number of bottles of each Krug Vintage are kept in ideal conditions in the House of Krug cellars. Tasted and appraised, they wait to blossom into a second life, a life that exalts time and reveals a new facet of this Champagne. Krug Vintage thus becomes Krug Collection. Krug Collection 1989: A very limited number of bottles of Krug 1989 were kept in ideal conditions in Krug’s cellars. Collection 1989 is now at this stage. The opulence, roundness, and extroversion present in Krug 1989 find a beautiful harmony with an elegant and silky character enhanced by an expansive texture and a lingering finish. Now over 26 years later, Krug Collection 1989 sparks new sensations that develop under time’s magical influence, expressing an outstanding new facet of this Champagne to the delight of collectors around the world. Deep intense golden yellow color announces maturity, opulence, harmony, and elegance. Exotic, complex nose consisting of honey with spices and white fruits, truffle, earth, slightly browned apples, a hint of high-toned flowers, yeast, and a gentle nuttiness in the background. Deep palate with bright, high youthful tones of pear, green apple, citrus fruits marmalade, fresh figs, and even a touch of earth with a finish that goes on and on with undertones of mineral and spices. Krug Collection 1989 is the perfect accompaniment of foie gras, fish in cream sauce, any dessert created with autumn fruits, or simply some slices of aged Comté cheese, as well as many other audacious combinations. Krug Clos du Mesnil: A very rare Champagne showcases the unique character of a single plot of Chardonnay, harvested in a single year. Our 1.84-hectare vineyard overlooked by the village church has been protected by walls since 1698. The vineyard is located in the heart of Mesnil-sur-Oger, one of the most iconic villages for Chardonnay in the Champagne region. Krug Clos du Mesnil has an expansive generous personality enhanced by the finish, which powers through with extreme precision. Krug Clos du Mesnil 2003: Krug Clos du Mesnil 2003 exalts the crisp purity of a single walled plot of vines (Clos in French): Krug’s Clos du Mesnil in the village of Mesnil-sur-Oger, and of a single grape variety: Chardonnay, all from a single year: 2003. The House of Krug chose to create Krug Clos du Mesnil 2003 because, from the very first tastings, the Chardonnay grapes of the 2003 harvest already revealed a delightful, expressive and balanced character without excessive aromatic intensity. It has tones of luminous yellow gold color, which shimmers with brightness and aromas of pralines, hazelnuts, ginger, and spices. In the palate you find strong flavors of honey, quince, and candied citrus fruit, with a long and slightly lemony finish. Krug Clos du Mesnil 2003 is the perfect accompaniment to fish, crustaceans, and spicy Far Eastern food. From a tangy wok of shrimp in sate spices to beurre noir skate wings with capers and spices or a traditional sole meunière, all revel in the flavors and aromas of Krug Clos du Mesnil 2003. Krug Clos du Mesnil 2000: A very rare Champagne, it showcases the unique character of a single plot of Chardonnay, harvested in 2000. Krug’s savoir-faire has successfully revealed the calm purity and indulgence of grapes from this single plot, enhanced by over ten years in the cellar, where it gained finesse and elegance. It has tones of luminous, very light gold with hints of green, and aromas of ripe apple, toffee, barely sugar, short crust pastry, raisins, honey, acacia and citrus fruits. In the palate you will find indulgent flavors of peaches and white blossoms, gingerbread, honey and orange zest. Krug Clos du Mesnil 2000 can be enjoyed with different fish and shellfish dishes, poultry, langoustine Carpaccio, scallops marinated in dill, lobster salad with citrus fruits, or grilled giant prawns. Krug Clos du Mesnil 1998: A very rare Champagne, it showcases the unique character of a single plot of Chardonnay, harvested in 1998. Krug’s savoir-faire has successfully revealed the intense and calm purity, chiseled structure and persistent aromas of this single walled plot in the year 1998, enhanced by over ten years in the cellar, thus gaining finesse and elegance. A unique luminous pale golden color with mineral aromas combined with those of candied fruit, praline and white truffle, boasting intense purity. In the palate flavors of citrus fruit, vanilla and herbs with chiseled structure. The velvet texture and persistent finish will amaze you. Krug Clos du Mesnil 1998 can be enjoyed with different fish and shellfish dishes, including the opulence of fish or chicken in a rich cream sauce, shrimp in cream curry sauce with fresh aromatic ginger, as well as the smoothness of great caviar. Krug Clos d’Ambonnay: Krug Clos d’Ambonnay celebrates with the rarest of Champagnes the unique character of a particular Pinot Noir grape that of a small, walled 0.68-hectare plot from the heart of Ambonnay, one of the most distinguished villages for this variety of grape in Champagne, and one which has played a very special role in the life of the House of Krug. Krug Clos d’Ambonnay reveals a personality with significant presence, great substance, and an amazing length and finesse. Krug Clos d’Ambonnay 1998: It celebrates, with the rarest of Champagnes, the unique character of a particular Pinot Noir grape. They are harvested in a tiny walled 0.68-hectare plot in the heart of Ambonnay, one of the most distinguished villages for this grape variety in Champagne, and one that has played a very special role in the life of the House of Krug. Krug’s savoir-faire has successfully revealed the fullness and intensity of grapes from this single plot in the year 1998, enhanced by over twelve years in the cellars gaining finesse and elegance. It has an intense golden color, with hints of red tones and amazing aromas of milky caramel, barley sugar, toasted bread, black currant, red fruit jam, and jellied fruits. In the palate you may find rich notes of wild fruits, tarte tatin, brioche, red currant, and liquorice enhanced by an elegant long finish. Krug Clos d’Ambonnay 1998 can be enjoyed with bold flavors such as: truffles, poultry, and noble shellfish (common and spiny lobster). It may also be enhanced by simple but wonderful food pairings such as shavings of aged Parmesan, scrambled eggs with truffles, pata negra bellota ham, or toasted rustic bread with truffles and extra virgin olive oil. Krug Clos d’Ambonnay 1996: Krug Clos d’Ambonnay celebrates, with the rarest of Champagnes, the unique character of a particular Pinot Noir grape. They are harvested in a tiny walled 0.68-hectare plot in the heart of Ambonnay, one of the most distinguished villages for this grape variety in Champagne, and one, which has played a very special role in the life of the House of Krug. Krug’s savoir-faire has successfully revealed the depth and intensity of grapes of this single plot in the year 1996, enhanced by over twelve years in the cellar gaining finesse and elegance. It is light gold with slight hints of violet, recalling its Pinot Noir origins, with sumptuous aromas of a plum tart fresh from the oven, brioche, lightly toasted hazelnuts, orange blossom, candied apricots, and citrus fruits. The palate is incredibly concentrated, full and deep, reminiscent of autumn fruits, an amazing freshness and great fullness, enhanced by very fine bubbles and a very long finish. Krug Clos d’Ambonnay 1996 can be enjoyed with pan-seared firm-fleshed white fish, sea bass with langoustine sauce or a light creamy almond sauce, boiled or grilled langoustines with a light sabayon cream, or simple top-quality food, such as pata negra bellota ham, or just a petit black truffle sandwich. Wine in France: Alice Paillard of Champagne Bruno Paillard on the delicate effervescence, remarkable purity, true freshness, and silly texture of Champagne style. Alice Paillard, manager at Champagne Bruno Paillard: It is probably the experiences abroad, combined with a fascination for the great wine that Champagne can be, that brought Alice Paillard back to where she grew up, in Reims. Alice Paillard, today works as a co-manager alongside her father Bruno. Text copyright ©2015 Margareth Henriquez. All rights reserved. Leave a reply on "Wine in France: Margareth Henriquez, CEO of Champagne Krug, shares with the world the vision of ultimate luxury that is Champagne"